Dempsey, Guy. Albuera 1811: The Bloodiest Battle of the Peninsular War. Frontline / Pen and Sword Books, Barnsley, UK, 2008. 336 pages. ISBN-13#: 9781848324992. Hardcover £25.00. The battle of Albuera was fought on Thursday 16th May 1811 between British, German, Irish, Polish, Portuguese and Spanish troops – although, no doubt, troops from a number of other nations could also have been involved. The battle ended with neither a clearly identified victor nor immediately obvious consequences for either side engaged. But, as this new work by Dempsey confirms, this was not the only reason why Albuera is perhaps one of the most unusual, and controversial, of all the battles that took place during the Peninsular War. Some of the established 'facts' surrounding the battle are relatively well-known and are restated clearly and succinctly within this work. The French commander, Marshal Soult, brought with him, to raise the first Anglo-Portuguese siege of Badajoz, an army of around 23,000 troops of all arms. The French force was comprised of an unusually high ratio of cavalry to infantry. Soult's infantry, with the exception of some grenadiers réunis, was comprised entirely of French regiments. Taking into account the effects of a recent reorganisation within the French army's command structure, Soult benefited from the support of an efficient, skilful and highly experienced group of general officers and staff. However, in addition to Soult's lack of decisiveness, once the battle commenced, one of the few areas of consensus amongst historians is that he brought too few troops to successfully complete the tasks set for his army. William Carr Beresford, meanwhile, assumed command of an allied army, that was about to undertake joint operations against the French for the first time, by mutual agreement. As commander in chief on this front, he enjoyed a variable, but on the whole good, working relationship with his Spanish colleagues; Spanish troops formed the majority of the allied force arrayed against Soult. The allied army was comprised of about 35,000 infantry, cavalry and artillery in total; of which some 14,600 were Spanish, 10,500 British (including Germans) and 10,200 Portuguese. Whilst Beresford was not helped by the more obvious limitations of joint command, such as language barriers and unfamiliar military hierarchy, he was also subject to moments of indecision and poor judgment. Both commanders were very capable organizers in their own right. In terms of deciding factors, perhaps Soult was the better strategist whilst Beresford benefited from the sound advice offered from his ultimate commander in chief. That the army of either commander showed no lack of personal bravery, courage and valour is clear; all three qualities were displayed in abundance amongst officers and other ranks throughout the day. The two commanders were both ably supported, but also at times let down, by their respective subordinates during the battle. These are all widely known facets from within existing historiography. So what does this book offer, in particular, to help the reader understand the campaign and battle and main protagonists? And, just as importantly, why does this battle continue to provoke so much controversy? A number of the individual details underpinning Dempsey's account in Albuera 1811 help to clear up inaccuracies in previous accounts or correctly establish a number of additional and interesting issues related to the battle. Some are of major significance and others less dramatic in nature. An example of the former is Dempsey's revelation that the account Oman reported he had unearthed in French archives, setting out the deployment of Girard's division, had been misunderstood and/or incorrectly translated. An example of the latter is that only the first battalion of the 51ème de ligne was present in Godinot's independent brigade tasked with undertaking the feint attack against Albuera village – i.e. as opposed to the three battalions of this regiment that have consistently been counted in Soult's army. Whilst uncovering these previously unknown, or overlooked, 'facts' is a laudable achievement in its own right, this is not the main aim of the book. 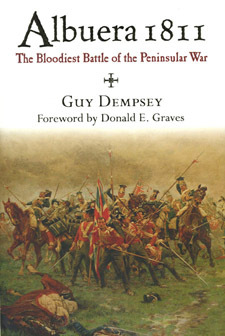 Rather, Dempsey sets out to achieve an ambitious and challenging series of objectives whilst the overall aim of the book is to present the serious historian with a much more cohesive account of the encounter – supported in some cases by additional, or previously unfamiliar, information, in others by a keen eye for detail and well-informed reasoning. The book has a number of strengths that help the author achieve these objectives. Firstly, and most importantly, it is meticulously researched. Dempsey's account is based upon a wide range of sources, many of which were previously unavailable to all but the most ardent researcher, presenting the views and perspectives of the wide range of soldiers and nationalities present at the battle. Individual viewpoints presented, typifying perhaps some of the contradictions inherent in the battle, include those of a Westphalian staff officer in Spanish service and the son of an Irish patriot fighting for the French. Secondly, not only are the various sources and accounts that Dempsey weaves together, to form this new version of events, presented in a highly readable, and impartial way but the reader is also furnished with concise references and footnotes supported by a comprehensive bibliography. Thirdly, there's an excellent, rigorously compiled and well-presented index. The scholarly foundations and professional presentation of the work ensure that those readers who want to know something about specific characters or aspects of the battle quickly, or those who want to know more and where to get it, are not disappointed. Finally, the book is very well-balanced, covering: strategy, operations, minor tactics and some very personal and moving insights into the experiences of the 'individual' participant (at all levels, from field marshal to private). We will return to these in more detail later. Moreover, Dempsey has pitched this book at just the right level. There is a succinct yet comprehensive introductory chapter outlining the strategic context for Soult's expedition. There are too many books out there that have a specialist subject to deal with and yet 'waste' many of the precious pages allotted by their publisher on general historical commentary that they could have pointed the interested reader towards instead. The way the author then skillfully combines, in a couple of subsequent chapters, the initial French campaign against Badajoz and the first British siege, together with an introduction to the main protagonists on each side, is impressive. Not only do these three chapters provide the context for the work overall, their format is followed in subsequent chapters. For example, the main theme for each chapter is introduced clearly and concisely at the outset. Each time a new character or perspective is introduced a brief biography for the individual, or some useful supporting information, helps to enrich the reader's understanding. This format works very well, representing both a unique, and very useful, way of introducing specialist and generalist readers alike to the subject matter. Chapters 4 to 10 provide the reader with a detailed examination of: the French advance to Albuera; the French feint; the initial contest between Girard and the Spanish; the first allied counter attack and the destruction of Colborne's brigade; the devastation wrought on both sides in the brutal, deadlocked fire-fight; the successful manoeuvre undertaken by Cole's division and the charge of the fusilier brigade; and, finally, the aftermath of the battle. The powerful and detailed analysis provided within these key chapters is supported by a set of well-drawn and professionally presented maps, with excellent cartography and supporting legends and nomenclature, setting out the key stages and major developments in the battle. In the five remaining chapters, in addition to covering the second siege of Badajoz, there is a detailed consideration of the dead, wounded and prisoners of Albuera and, finally, a thought provoking discussion of specific controversies surrounding the battle and some interesting conclusions. As would be expected from a work of this quality, there is a full set of appendices including detailed OOBs, unit strengths and casualties (killed wounded and missing). Given Dempsey's intense interest in the actual units and soldiers he researches, there is also some information on the uniforms of the three main nations represented on the field. There are three further sections dealing with: the origins of the nickname 'diehards' for the 57th regiment; narratives relating to the captured colours; and the after effects of the battle – including some useful biographies and unique insights into medals and awards: for example who was and was not received into the legion of honour, the distribution of Spanish and Portuguese medals and even some details for allied soldiers with clasps on their general service medal for Fuentes D'Oñoro and Albuera. There is much in the way of new and interesting material here but, and again this is only a minor complaint, the subject matter of the second (and unsuccessful) siege and the subsequent chapters dealing with the killed, wounded and missing of Albuera appear to 'run into' each other and would have benefited from a more clearly defined structure. Finally, no account of Albuera would be complete without at least some reference to the 'pamphlet war' arising from Napier's account of the battle in his history – and Dempsey duly provides a brief review of the salient points. To return to the four principal levels upon which the work operates, namely: strategy, operations, tactics and the individual perspective – these are afforded treatment in proportionate measure throughout the book given its specific subject matter. Around fifty pages, or just over a fifth of the substantive section of the book, are concerned with strategy and organisation. The initial chapter devoted to the overarching strategic context, including the French invasion of Portugal, and the 20 or so pages covering Soult's successful initial campaign and siege of Badajoz, provide all the essential background and context we need for the French perspective. The allied standpoint, Wellington's strategy and Beresford's options, are subsequently covered in a chapter of about 20 pages in a comparable manner but, perhaps understandably given the range of Anglo-centric accounts available, with slightly less detail. There are two very useful maps to provide a general picture of southern Portugal and south western Spain; and the major roads and rivers in Spanish Extremadura and adjacent regions, in early 1811, in support of these first three chapters. The book would have benefited from some reworking of the preliminary analysis presented in these chapters, setting out the controversies, and some concluding findings, relating to French and allied strategies in this particular theatre of the Peninsular War. This is a relatively minor omission and, that being said, the analysis presented at this higher, strategic level within the work is fairly comprehensive, for such a specialised book, and both thoughtful and well-presented. As would be expected, the bulk of the work is concerned with the battle itself, minor tactics and the perspectives of participating individuals: in these aspects, the book represents, in my opinion, a major step forward from existing historiography. In addition to revising established accounts, it provides a comprehensive and compelling account in its own right. The chapters relating the French advance and feint, and some of the analysis presented within subsequent chapters, would have benefited from a map detailing the topography of the sub region. Such a map would have been particularly useful to aid our understanding of the options and actions of Soult and Beresford. From a French perspective it would have helped understand the challenges faced by Soult, including the route chosen, in achieving his objectives, namely: the relief of Badajoz, his intentions to drive a wedge between the allies and, ultimately, his strategy for the battle. From an allied viewpoint, it would have helped to understand the approach adopted to siege-work against Badajoz, the crucial relationship between the position chosen for the battle and the allied line of communications and, should it be required, the line of retreat via Valverde and Beresford's anxieties about ensuring the concentration of all his disposable force. It would have been particularly useful, for example, in understanding the difficulties faced by Kemmis, upon being called in by Beresford, when the river rose in spate forcing him to march via Elvas and Jerunmenha to make the crossing to the left bank of the Guadiana. Dempsey introduces a great deal of new and highly detailed information within these key chapters: not only is there a lot of material to analyse, concerning each specific stage of the battle, there are narratives that both corroborate and contradict each other. The key to interpreting the wide range of sources are the overall flow of the battle, its topographical features and the positioning the author has worked out for the units involved in each stage of the engagement. There is often insufficient information, or information of a potentially conflicting nature, to make truly definitive statements about some of the movements undertaken by the French and allies. However, with meticulous attention to detail, the author has managed to piece together a coherent and compelling account. There may yet be some controversy relating to highly specific aspects of the engagement remaining from French and allied perspectives. Two examples from a French viewpoint would be the actual formation adopted, and subsequent actions of Veiland's and Brayer's brigades during and after the passage of lines and the deployment of troops by Pépin and Maransin during later stages of the battle. From an allied standpoint, the movement of Spanish forces on or near to the southern knoll, on the extremity of the allied position, the actual point at which the 1/3rd, 2/48th and 2/66th moved clear of the allied right flank, and the location and nature of their encounter with the French will also, no doubt, be the subject of continuing debate. To conclude, the book offers a comprehensive re-appraisal of the battle: providing us with some additional sources and fresh insights from old ones. Dempsey in his acknowledgements, and Graves in his foreword, recognise the foundations upon which the book has been built. At the same time, the author has extended the scope of previous studies: addressing at one and the same time the essentially Anglo-centric nature and limited focus of the vast majority of existing historiography. The detail Dempsey has deployed from within the many, and disparate, narratives has taken our understanding of this encounter to a much higher level. I bought this book because I lacked a detailed level of understanding of this theatre of operations (in Spanish Extremadura), in general, and this battle in particular. I have not been disappointed. As a single volume work, covering a specific campaign and battle it is, without doubt, one of the best published in a long time. It is not an introductory text by any means: but the language used in the work, and the level of detail provided, will meet the needs of both the specialist historian and history 'buff' alike – for a long time to come. © 1995-2017, The Napoleon Series, All Rights Reserved.